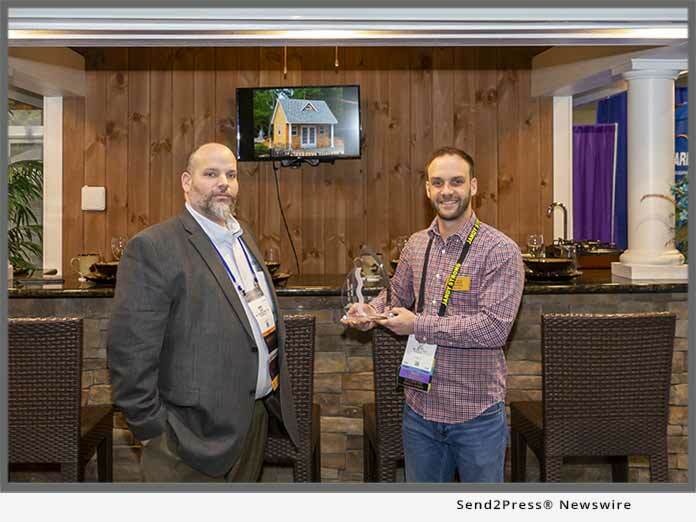 NEW HOLLAND, Pa., Feb 08, 2019 (SEND2PRESS NEWSWIRE) -- Homestead Structures, LLC took home the Best Booth award in their size class at the 2019 Pool & Spa Show with their full-size Siesta Poolside Bar & Pergola display. The show, hosted in Atlantic City from Jan. 29-31, is put on by the Northeast Spa & Pool Association and attended by thousands of pool & spa industry professionals. The sturdy, detailed craftsmanship of the Amish-built pool house stood out amongst all of the very modern, cutting-edge products and technologies being shown to pool and spa professionals at other booths. It drew the attention of attendees and show organizers alike. "I can't tell you how many people stopped and told us our display caught their eye from halfway across the show floor. They couldn't stop commenting on the quality and how much their customers would love something like it with their pool - we were very humbled and grateful for all the great feedback we received," says Stephen Stoltzfus, owner of Homestead Structures. On the last day of the show, representatives from the Northeast Spa & Pool Association made their rounds to hand out awards, chosen by a team of organizers and based on which booths seemed to generate the most attention and excitement. Homestead won Best Booth in size class 201-400 square feet for their 18-foot x 14-foot Siesta Poolside Bar & Pergola display. To learn more, visit: https://www.homesteadstructures.com/. Homestead Structures is a Lancaster County-based builder helping people transform their outdoor living spaces and solve their storage problems. Not your typical Amish shed builder, Homestead specializes in designing and building hand-crafted pool houses, pavilions and pergolas as well as garages and sheds. Founded by Steve and Martha Stoltzfus in 2003, they quickly saw an opportunity to break away from typical shed construction by offering outdoor living structures that give customers space for all the important things in life - connecting with friends and family, making memories, sharing with others, and enjoying life to the fullest. Homestead works directly with homeowners, contractors, pool builders and landscapers and has several dealers throughout the Mid-Atlantic. For more information, please visit: https://www.homesteadstructures.com .